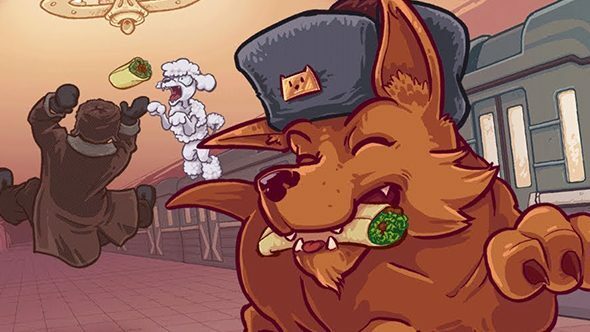 Russian Subway Dogs, as the title might imply, is an indie game about the puppies that populate the streets of Moscow. These good boys (and girls) ride the Russian subway, surviving the harsh winter by commuting from station to station and begging for food – or stealing it. That’s a solid enough concept for a game, but the really notable thing is that it’s all true. The tale of Moscow’s stray dogs has been frequently reported over the years, particularly following a 2010 study on the population. That study estimated roughly 35,000 homeless dogs in the city, and found that a handful of them had learned how to commute on the metro, sleeping in the safer stations and riding to the busier areas where they can more effectively beg for food. Pet – er, rather, play the best indie games on PC. Coming from Spooky Squid Games, the makers of They Bleed Pixels, the puppy-powered arcade-style game will hit Steam on August 2. But look, you’re here to see adorable dogs and you can do just that in the new trailer below. The arcade action is built on all manner of systemic simulations, letting you use items for particular results – like distracting rival pups, powering yourself up, or gaining the favour of the pigeons for some impromptu air support. It’s a nifty concept, and one made all the more endearing by being almost unbearably adorable.